There is a long list of items that compete for our attention these days. There are the everyday responsibilities that emanate from our professional and personal lives. There are the abundant entertainment options available from television, movies, and sports. There is the online world which covers email, web surfing, and social media. Basically, there are lots of ways available for us to spend our time. Conventional thinking says the most successful people are able to incorporate and manage all of these distractions into their daily lives. They achieve their level of success because they are able to multi-task, meaning switch quickly and efficiently between distractions, better than others. In other words, they don’t spend a lot of time on any single task but are able to spend small amounts of time on many items throughout the day. What if conventional wisdom is wrong? What if the most successful people are those who are able to filter out all of the distractions and instead focus on a singular, meaningful, important, complex task? Is it possible that multi-tasking is not a true indicator of success? 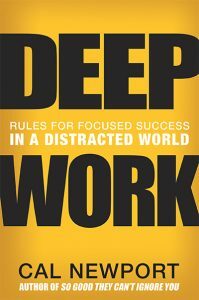 In Deep Work: Rules for Focused Success in a Distracted World, Cal Newport explores this very topic. He makes the case that the ability to focus is more important than the ability to multi-task. I was intrigued by his contrarian point of view and was interested in learning more. His supposition is that deep work is necessary to get all of the value out of one’s intellectual capacity. He references research in the fields of psychology and neuroscience which shows that the intense mental effort applied during deep work is necessary to improve one’s abilities. And it is that improvement in one’s abilities that differentiates a person, increases their value, makes them sought after, and allows them to achieve the highest levels in their chosen field of study. It’s a startling discovery, and one that makes perfect sense after reading Newport’s work. To make his point, the book is divided into two parts. In the first part of the book, Newport explains why deep work is valuable, rare and meaningful. In the second part, he lays out his four rules for achieving deep work. These rules can be readily applied, but they require a shift in one’s habits and mindset. The state of deep work to which Newport says we should aspire cannot be achieved otherwise. What is interesting is seeing how Newport was able to apply these rules to his own life. He reveals his challenges and shows how to overcome them. He also talks about what he was able to accomplish by working deeply, which was pretty impressive. I got a lot out of reading Deep Work. Newport makes a good point that falling victim to the distractions of modern society does not lead to success. It leads to shallow work where many things may get done, but none of them add a tremendous amount of value to one’s life. I’ll admit that it’s a trap that I’d fallen into and am working my way out of. I’m working to incorporate the methods outlined in his four rules into my daily routine. I’ve also recognized that these methods are skills. In other words, they aren’t things that you can learn and then forget about. Just like any other skill, such as playing a sport or musical instrument, programming, eating healthy, or staying physically fit, you have to regularly practice the skills to maintain them and get better. If you don’t, the skills will atrophy. The bad habits will come back because the distractions aren’t going away. If anything, the distractions are growing in number, along with their power. It makes it all the more important to continually practice the concepts of deep work to make them an integral part of one’s everyday life. This entry was posted in Book Reviews, Must Reads and tagged Books, Must Reads on April 15, 2019 by Gregg Borodaty.